The YouTube button is used to search, view, and add YouTube videos to your posts. 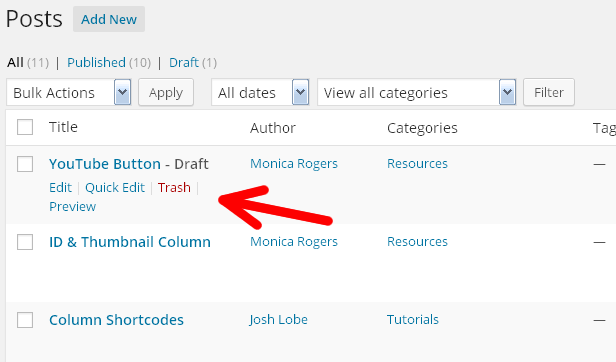 It has been updated to use the newer version 3 of the YouTube Developers API. 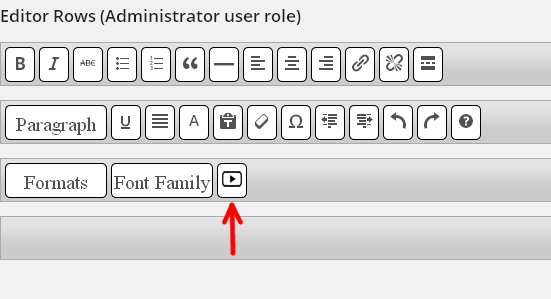 If you cannot find it, be sure to select the Toolbar Toggle Button. You can preview the video before you add it to your post! 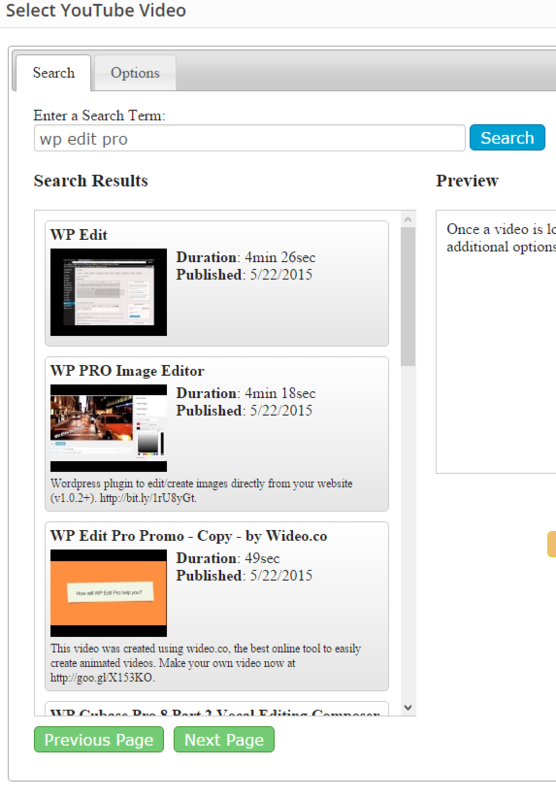 The options will allow further customization over how the video is displayed on the final page. The more popular options include the ability to auto-start the video; removing the YouTube branding; or removing the related videos that display when the video playback is over. More information regarding advanced options can be found on the YouTube Parameters Page. Height: This parameter allows you to edit the height of the video player. Width: This parameter allows you to edit the width of the video player. autoplay: Default is OFF. Sets whether or not the initial video will autoplay when the player loads. rel: Default is ON. This parameter indicates whether the player should show related videos when playback of the initial video ends. modestbranding: This parameter lets you use a YouTube player that does not show a YouTube logo. Set the parameter value to ON to prevent the YouTube logo from displaying in the control bar. Note that a small YouTube text label will still display in the upper-right corner of a paused video when the user’s mouse pointer hovers over the player. showinfo: The parameter’s default value is ON. If you set the parameter value to 0, then the player will not display information like the video title and uploader before the video starts playing. theme: This parameter indicates whether the embedded player will display player controls (like a play button or volume control) within a dark or light control bar. Valid parameter values are dark and light, and, by default, the player will display player controls using the dark theme. See the YouTube API blog for more information about the dark and light themes. fs: For the AS3 player, the default value is 1, which causes the fullscreen button to display. Setting this parameter to 0 prevents the fullscreen button from displaying. OFF – Player controls do not display in the player. For IFrame embeds, the Flash player loads immediately. ON – Player controls display in the player. For IFrame embeds, the controls display immediately and the Flash player also loads immediately. 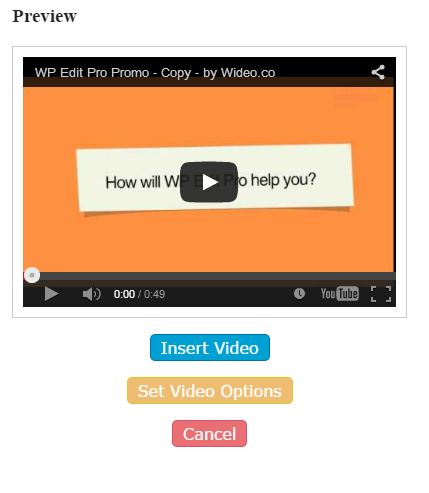 In this new version; a previously inserted YouTube video can now be re-selected and edited. 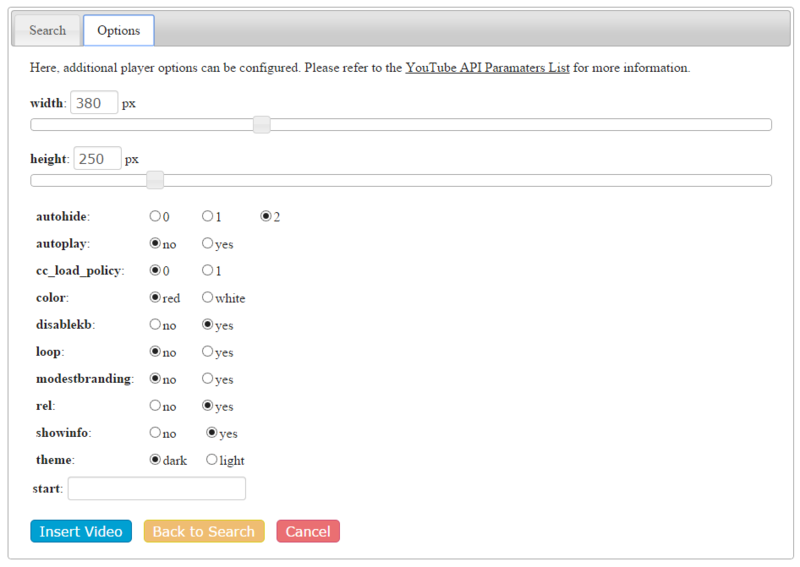 The selected options will be automatically populated back into the “Options” tab of the YouTube window. No worrying about having to start over anymore!